Get the professional-quality video security system you need to protect what you value most without having to pay for expensive installation. A Defender PRO security system provides the all the equipment you need to cut out the middle man and set up your system, your way. The weather-resistant cameras are built to last with heavy duty mounting hardware and anodized aluminum casing. Widescreen viewing with 800TVL resolution to have a night vision length between 75’ (for Dome Cameras) and up to 150’ (for Bullet Cameras) which means you’ll be able see more of your property in finer detail than traditional DIY systems afford. The included 2TB hard drive, FT4 fire-rated cabling, HDMI output and intuitive menu work together to take all the hassle out of installation, setup and storage. And with 1 Step™ Remote Viewing, you’ll be able to play back recorded footage or check on your property in real-time on any device with an Internet connection. Perfect for any business or home application, you’ll experience peace of mind you never thought possible while knowing you did it all yourself with Defender PRO. 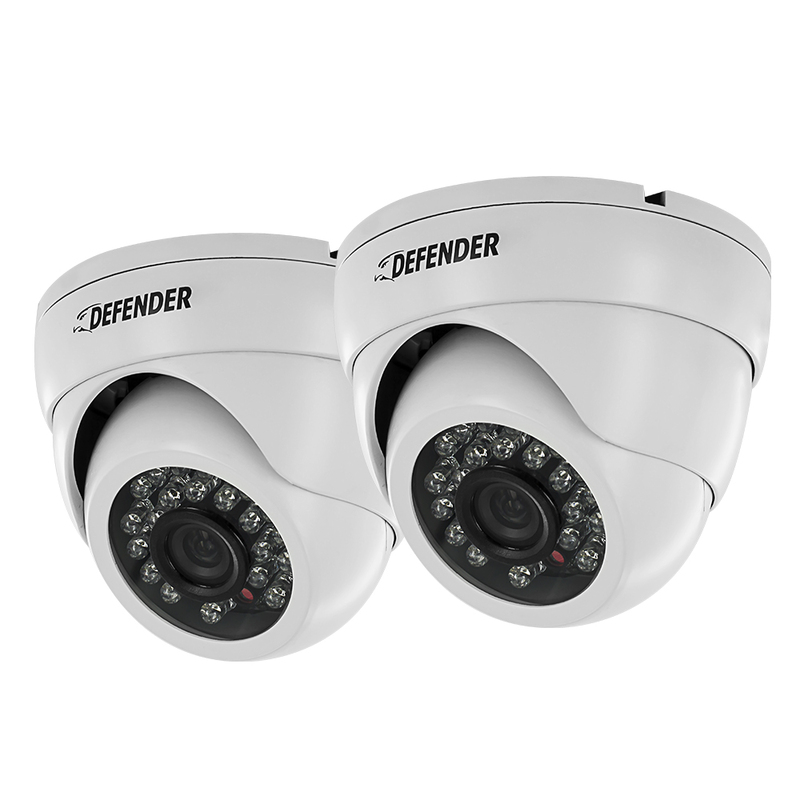 Every Defender PRO Camera is outfitted with 48 infrared LEDs (Bullet Cameras) or 24 infrared LEDs (Dome Cameras) that will let you view any property from up to 150’ away in complete darkness – equal to the distance of half a football field! All Defender cameras’ impressive night vision capabilities are tested in perfect darkness at 0 lux, which means range may even be extended in ambient or low-light conditions. Easily check-in on your business or home on the go thanks to our 1 Step™ Remote Viewing software. Simply input your DVR’s IP address (easily found in the menu) into the connection program on your computer, click “Sync to Router”, and 1 Step will auto-network your DVR in seconds. Free to download and free to use on both PC and Mac, take advantage of the convenience of mobile viewing on your smart device without any of the complications. Quickly and easily play back years of high quality video footage stored on the included 2TB hard drive that only you have direct access to. Rest easy knowing your footage is safe and secure on your Defender PRO DVR. To properly install a security system, you need the proper equipment. All Defender PRO Cameras come equipped with 65’ of fire-rated FT4 cabling. Your in- wall wiring will meet regional building codes while you remain one step ahead of the inspector. 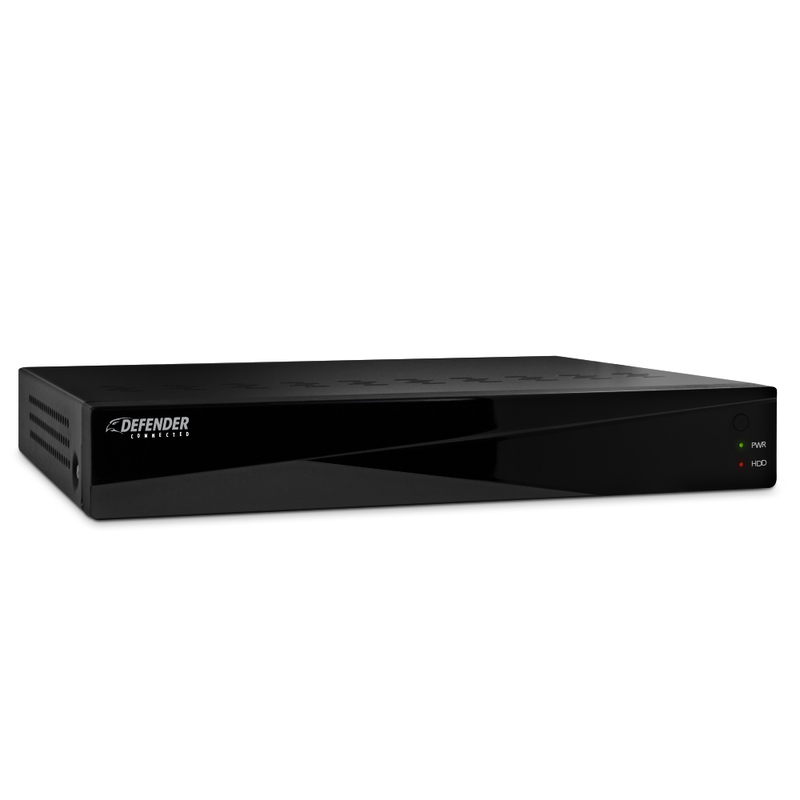 Customizing your Defender system is as easy as recording your favorite TV shows to a cable box. Options like Motion-Activated Email Alerts, Area Masking and Event Search are all easily accessible thanks to the menu’s built-in coaching feature, which helps you set up and understand your system’s settings. Whether navigating via remote control or USB mouse, your Pro system speaks your language. Defender gets you the crisp, clear picture you need so you know exactly what’s going on at your business or home. PRO systems feature 800TV lines of resolution meaning you’ll have smooth, finely detailed live or pre-recorded video available whenever you want it, via HDMI/VGA output or wirelessly on your Internet-enabled computer or smart device. With 34% more surface visibility than standard security cameras, Defender PRO DVRs use 960H technology to let you see more. 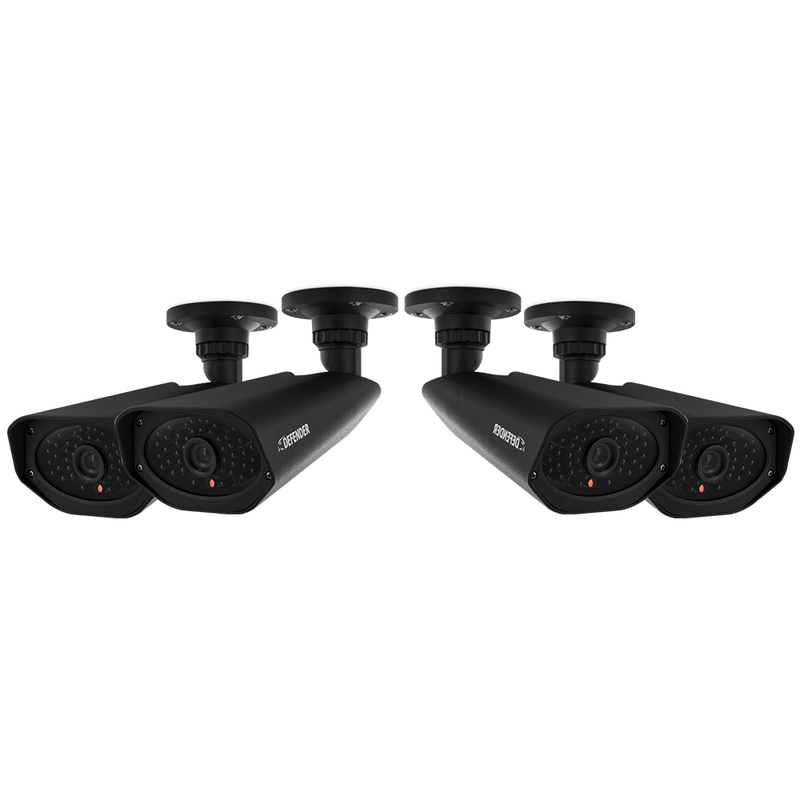 Whether you’re monitoring a darkened parking lot or well-lit backyard, your DVR allows you to watch and record video in resolutions as high as 960 x 480. And since you’re capturing video in real-time, you will always have access to a detailed record of all activity happening on your property. Setting up your viewing options gives direct control over each area you wish to monitor. Custom name each individual channel so you can easily identify the location of activity. Use the Masking feature to block out a portion of the scene from an individual camera such as a cash register or safe while still seeing the activity around the masked area. Other viewing options include picture-in-picture, full screen, quad screen, 9 channel view, digital zoom and sequence switching. Each recorded area is complete with time and date stamp so you can search by event and easily find recorded footage from all channels. Any serious security setup needs serious hardware: the anodized aluminum casing gives PRO cameras full protection from the elements in addition to any cosmetic wear and tear (weather-resistant IP66 rating). The included heavy duty vandal-resistant mounting hardware allows you to securely affix your camera to almost any indoor or outdoor surface. IR illumination range up to 150ft under ideal conditions. Objects at or beyond this range may be partially or completely obscured, depending on the camera application Defender highly recommends the use of an Uninterruptible Power Supply (UPS) with surge protection for all products. Although the cameras are weather resistant, they are not weatherproof. Not for use in direct exposure to water, rain or snow. Requires broadband router and broadband internet connection—not included. Internet browser is required. Must set up user profile in menu before using. I considered wireless cameras but I was not impressed with the quality of a competitors product. I live in a bungalow so for me this wired system worked out perfectly. The device is in the attic and all the cameras come out the soffit or ceiling. . All set up in less than a day. The night vision is definitely good enough to cover my driveway the full sixty feet. We purchased this about a month ago and we are very happy with it. Needs a built in modem. I don't have it setup next to my computer so I can not set up on internet. Bought this package back in Feb. and it is now July and I am just now installing, due to bad weather and working too much overtime, anyway, have 4 cameras up and running, 6 more yet to install, installation was easy except for running the wires thru the attic. Cameras are very clear and have even better night vision than I expected, so I do highly recommend this system. The most difficult part was getting the cameras on line for internet and cell phone viewing, instructions for the port forwarding have a lot to be desired, after several weeks of trying to get them on line myself I gave up and sent their tech support an email and they called me back just a few hours later. It didn't take their tech no time to get the system on line and on my phone. Many, many thanks to Michel (their tech guy) for all the help getting my networking up and running...Networking is something that I don't think the average person will be able to do on their own so plan on contacting their tech support for help. The cameras seem to be of very high quality, very sturdy and well made. Getting the cameras set up and plugged in to the DVR and able to view on a separate monitor was simple plug and play, as I said the main problem is with networking, so call tech support for help. The lack of a written manual made setup even more difficult. The only reason I gave this 4 stars for ease of use instead of 5 stars was because of the difficulty of setting up the networking. The ease of use for operating the DVR and cameras itself is 5 stars.. There is nothing like piece of mind when setting up this easy DIY systems. I can now see deliveries on my doorstep and can see when some one parks in my driveway. I love the fact that I can view my house when I am out of town. Affordable, Great Quality, Easy to Install! I bought one system for my home and I love it! I ordered 4 more systems for my businesses. I completely recommend it. It was so easy to view on my phone. The clear vu ap is amazing! I had trouble getting the DVR to show cameras on my IPHONE.Talked to Michel and he was a great help.With his help I can now monitor my home when im not there. This is our 5th purchase. The most reliable and easy to use that I've seen in a long time. I bought my cameras about 3 weeks ago not and not only would I buy them again I have recommended them to my friend. This is the third set I have purchased and sent the other two manufacturers product back. The night vision is excellent also. The only drawback I have found is they cant be watched on the internet due to the fact I am on Satellite Internet package. From what I understand this is a issue with all cameras and not just defenders. Bought this for our church and we are happy with it. Price is great for the stuff you get. We were having some really bad vandalism issues with some of our neighbors. With 16 cameras the system gives excellent panoramic view of the entire 3 lot property. When the system went up everything stopped immediately, which in a way was dissapointing in that we have excellent coverage with a good clear picture and we wanted to press charges! So much for vengence, but now we have peace of mind!! I PURCHASE THIS SYSTEM FOR MY RETAIL BUSINESS AND IT WORKS GREAT.......I WOULD RECOMMEND IT TO ANYONE CONCERNED WITH THEFT OR SOMEONE WHO NEEDS TO KEEP AN EYE ON MULTIPLE AREAS AROUND A BUILDING OR HOME. I brought this item few days ago - had few issues on network settings, to getting a customer service is hard but they are so good and so knowledgeable.